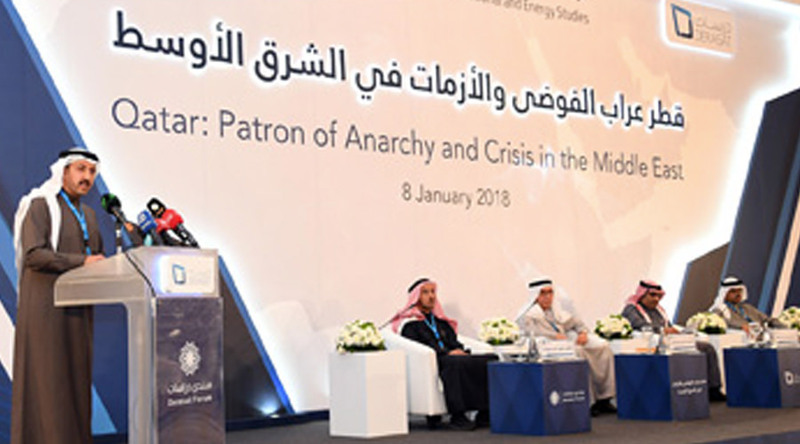 On January 8, 2018, the Bahrain Center for Strategic, International and Energy Studies (Derasat) organized the first annual “Derasat Forum” entitled, “Qatar: Patron of Anarchy and Crisis in the Middle East”. The Forum comprised three sessions: Session 1: Qatari threats to the Kingdom of Bahrain: past and present Session 2: Examples of Qatari involvement in destabilization, and undermining of national institutions in Arab countries Session 3: Gulf security and future scenarios of Qatari hostile policy. First, Qatar to immediately halt all actions that undermine Arab national security and international peace. Second, the Qatari government to cease all hostilities against the Kingdom of Bahrain. Third, a call upon the international community to take serious actions to confront the aggressive practices of the Qatari regime. Fourth, the Qatari government must comply with the six principles emanating from the 13 demands, as stipulated in the 2014 Riyadh Agreement, and should initiate a dialogue leading to specifics measure and durable solutions.